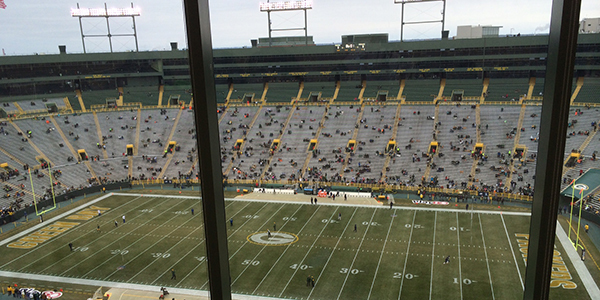 Green Bay Packers – Official Blog | Pregame warmup: Are MVP votes at stake today? Pregame warmup: Are MVP votes at stake today? GREEN BAY — Packers QB Aaron Rodgers would appear to be in good position to make a run at his second NFL MVP award this season, but Patriots QB Tom Brady is also a viable candidate. How much the head-to-head result on Sunday at Lambeau Field might weigh in the MVP voting at the end of the season is hard to say, but it certainly could be a factor. Currently, Rodgers leads the league with a 119.2 passer rating, nearly 10 full points higher than the next-highest rated passer, Peyton Manning (109.5). Brady lags a bit further back at 101.0, but he has beaten Manning head to head and now has a chance to beat Rodgers, too. Rodgers’ TD to INT ratio of 30-3 is way ahead of the field, and his 12 completion of 40 yards or more also ranks first in the league. The Packers won’t face a defense as strong as the Patriots’ again until Week 17 when Detroit comes to town, so a lot will be made of Rodgers’ performance today with regards to MVP votes. Injury update: The Packers are getting LB Nick Perry back from a shoulder injury this week after Perry missed last week’s game in Minnesota. Perry didn’t practice last week or this week until possibly Saturday, the Packers’ final workout to prep for the Patriots. In his absence last week, the Packers gave more snaps to Mike Neal and worked undrafted rookie Jayrone Elliott into the rotation. Elliott is active again this week as well. Perry’s presence, combined with the way the Packers handled his absence last week, would indicate Clay Matthews will continue to play a lot of snaps at inside linebacker and move around on occasion. For the Patriots, pass-rushing DE Chandler Jones is inactive with a hip injury. Who’s guarding whom: One key question all week has been how the Patriots cornerbacks will match up against the Packers receivers. New England’s Darrelle Revis and Brandon Browner form one of the league’s best duos, as do Green Bay’s Jordy Nelson and Randall Cobb. If last week can be used as any gauge, the Patriots put Browner on Calvin Johnson, with safety help over the top, while Revis took Golden Tate. That would suggest Browner vs. Nelson and Revis vs. Cobb in this game, but with the Patriots, there’s really no telling. How the Packers decide to guard Patriots TE Rob Gronkowski will be equally as intriguing. Chances are there will be a mixture of defenders used, from Matthews to Julius Peppers to Brad Jones at linebacker, but also Morgan Burnett, Ha Ha Clinton-Dix and Micah Hyde in the secondary. Weather update: Temperatures are expected to be around 30 degrees at kickoff but falling throughout the game, into the low 20s by the end of the contest. Winds are also expected to pick up, which could drop the wind chill into the single digits by game’s end. In the NFC North: With Detroit’s win over Chicago on Thanksgiving Day, the Packers must win today to keep their one-game lead over the Lions in the NFC North standings. Detroit is now 8-4, while the Packers are 8-3. The two teams will meet at Lambeau Field in Week 17. Hyped up: With these two teams a combined 14-1 over the last two months, the hype has been off the charts. Aside from the Week 17 win-to-get-in playoff scenarios the Packers faced last season and in 2010, this is the most anticipated regular-season game for the Packers since late November in 2007, when they traveled to Dallas to face the Cowboys with both teams sporting equal 10-1 records. How have the Packers handled the hype? Here’s one way.